The first of the year is when most people make their resolutions and hopes for the New Year. For some it’s a desire to break a habit such as smoking and others to make a new habit of drinking more water. A habit is basically a pattern that becomes ingrained into our daily lives. 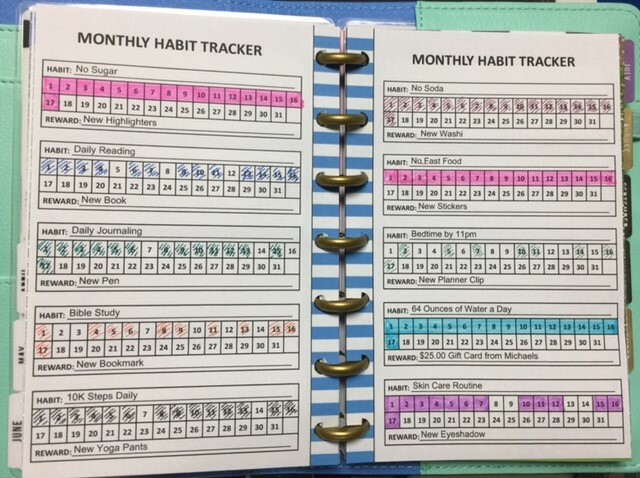 A Habit Tracker is a valuable tool that can be kept in your planner to assist you in recording and documenting your progress for the habit to be created or stopped. What kind of Habits can you track? Anything you can think of. However, since I wouldn’t be me without creating a list. I have provided a few suggestions to help you out. Write it down – Planners love to make lists and write things down and this is where a Habit Tracker makes it easier to do that. One habit at a time – Breaking or making new habits is difficult enough let alone trying to balance multiple habits. Trying to break or make more than one habit at a time is only setting you up for failure. Keep it simple and focus on one at a time. Identify your triggers – Be aware of what can make you want the bad habit you are breaking or what thing can help create the new habit. Set a realistic goal – Try giving yourself a full day first and then lengthen it by a week and then add another week to your goal. Start small and slow so that you can better measure your success when achieving the smaller goal. Know your motivations – Why are you making this change? Is it for you or your family? Why is it so important that there must be a change? Ask for help – Support is huge when you are making changes in your life. When your family and friends support what you are doing they can help you stay on track. Remove negative thoughts – Often we have little voices in our head that are negative. Those thoughts can sabotage your progress and success. Instead of beating yourself up with the negative thoughts try acknowledging the positive light of things. For example: I cheated and drank soda today, but I have gone 2 weeks without having any. Rewards – Give yourself a mini reward for meeting your goals. If you made it a week without biting your nails, then buy yourself a new bottle of nail polish. Mini rewards are important to acknowledge that you are succeeding and a great way to keep track of your milestones. Write it in your planner and give yourself a sticker for meeting that goal. While some experts claim that it takes twenty-one days to form a habit, others say this is just merely a myth. Although what is truly important for any habit to be made or broken is consistency and if you want change – you must put forth the effort. To help you stay committed I am including a free Monthly Habit Tracker of all sizes of Happy Planners.